My name is Simon Okoth. I work for the Water Services Trust Fund as a program officer in charge of sanitation. With this posting I present to you the UBSUP program which is implemented by the Water Services Trust Fund and financed by the Bill and Melinda Gates Foundation, KfW and in kind contributions and technical support from GIZ. 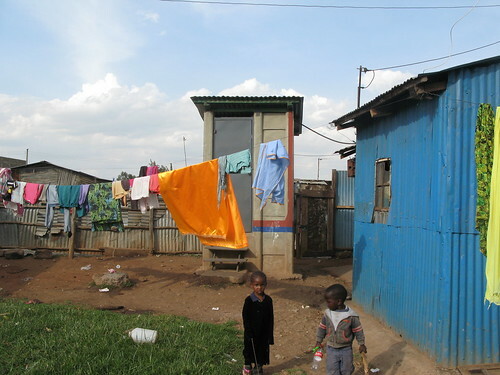 Up- scaling of basic sanitation for the urban poor involves improving the living conditions of the urban poor in Kenya through enhanced access to basic sanitation and safe water. 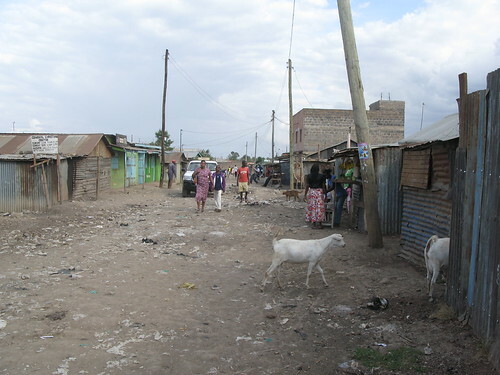 Rapid urbanization combined with a widening income gap between rich and poor and limited economic opportunities of the poorer strata in the society are the main causes of the increasing growth of the low income urban settlements including slums in Most African countries. Slum dwellers, however, face serious inadequacy in access to safe water and basic sanitation as characterized by deteriorating living conditions. Kenya is one such African country facing these challenges. The country has more than 1,800 low income areas with a total estimated population of 8 million. The lack of access to adequate basic sanitation by the poor population has had devastating infant (under five) mortality effect, insecurity especially to women at night and low dignity among other sanitation burdens. It is in this context that the WSTF jointly with GIZ are developing a concept for up-scaling sanitation in low income urban households with a focus on household and plot-level sanitation aimed at improving the living conditions of the urban poor in Kenya through enhanced access to basic sanitation and safe water. 1. The project is successful when it provides sustainable sanitation for over 800,000 people and safe water for 200,000 in the urban low income-areas in Kenya and will have achieved satisfactory performance if 600,000 are reached with sanitation and 100,000 with safe water. Sanitation technical options (hardware): The Proposed Programme focuses on adaptable technologies and specific solutions developed for areas with high population densities, unfavorable soil conditions, high water tables, etc. This includes adaptable and affordable designs such as EcoSan facilities, etc. Stakeholders ensuring a multi-level approach: The implementation approach is to be integrated into the water sector policies, institutions and procedures through a multi-level engagement which builds upon the strengths and weaknesses of all sector stakeholders. This includes capacity building at all levels with emphasis on the local (town and area) level in particular with clear feedback of best practices and lessons learnt mechanisms. Sanitation promotion: The development and use of innovative social marketing techniques aimed at increasing the demand for improved sanitation. The focus of the social marketing program is not entirely on the health advantages of improved toilets but also on improved privacy, dignity and user-friendliness. Financial contributions: The programme has adopted a subsidy approach as an effective plot and household sanitation approach that ensures that decision for the adoption of improved sanitation is taken by the household, the landlords and/or the tenants and the ownership of the facility and sustainability is fostered through contribution from the household, the landlords and/or the tenants. Last Edit: 04 May 2018 13:30 by muench. This is to inform you that we also have an UBSUP flickr account which has quite a number of pictures that the team members have taken since the start of the project. We currently have the following folders in the UBSUP collections in our flickr account. Last Edit: 22 Apr 2013 13:39 by Doreen. 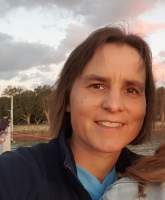 Thanks a lot for introducing your grant on the forum. It is a bit different to the other grants that have been introduced so far because it does not deal with research as such, at least not with fundamental research, but rather with implentation and upscaling. So it will be very interesting to read more about your results to date. I look forward to reading any reports and presentations soon when they become available. Please explain what you mean with "EcoSan facilities"? Is this UDDTs? Single or double vault? Which social marketing techniques have you used so far or are you planning on using? What % subsidy are you providing? Only the landlords can access the subsidies or also the tenants? Is the subsidy only for construction cost (once off) or also for ongoing maintenance costs? What incentive does the landlord really have to invest in a toilet? Is the main incentive to increase the rent afterwards? Have you considered mobile systems which could be be independent of the landlord/tenant relationship which is also a power relationship? If I was in Kenya, is there anything that I could SEE and touch (or smell?) in terms of implementation under this grant or is it only on paper so far? Last Edit: 25 Apr 2013 09:47 by muench. Thanks a lot for your questions and my apologies for the delayed response. 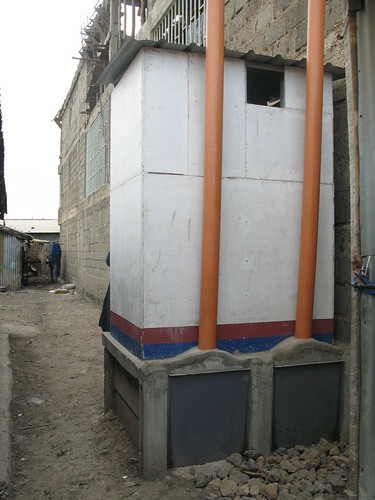 When we say EcoSan facilities, we mean the double vault UDDT. The vaults are to be used alternately one in every 6 months for a standard user population of 10 people per double vault facility. In addition to the UDDTs, we also have other technologies to fit the needs of the beneficiaries such as pour flush/cistern connected to septic tank or sewer. We have quite a number of innovative social marketing techniques that are currently being tested within the UBSUP programme. We have integrated specific components with different marketing techniques to come up with a solution that fits the Kenyan context. Our guiding principle are the 6 P’s of sanitation marketing i.e. Promotion, Partnership, Policy, Place, Price and Product. In addition, we also have further P’s such as Participation and Positioning (using other marketing entities to inform the beneficiaries about the product). The programme has adopted a subsidy approach as an effective plot and household sanitation approach that ensures that decision for the adoption of improved sanitation is taken by the household, the landlords and/or the tenants and the ownership of the facility and sustainability is fostered through contribution from the household, the landlords and/or the tenants. We are not considering mobile systems which could be independent of the landlord/tenant relationship. 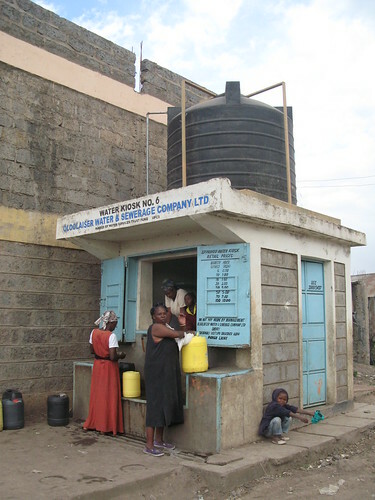 What we are offering are solid stationary sanitation infrastructures that meet the criteria of improved sanitation facilities as per the department of public health and sanitation, Water Services Regulatory Board (WASREB), National Environmental Management Authority (NEMA) and Kenya Bureau of Standards (KEBS). We have constructed 17 test UDDTs at household level and we are currently up-scaling the test into a full pilot with three WSPs. Our biggest successes so far is the UBSUP preparatory study which was carried out in 11 towns, the testing of the UDDTs, involvement of the WSPs right from the initial stages, Integration of WSPs and other stakeholders views in the UBSUP concept. Main challenges pertain to developing incentives for the WSPs to fully integrate on-site sanitation within their programmes. Two weeks ago, I had the pleasure to visit three of the plots in low-income urban areas near Nairobi that have received UDDTs (urine-diverting dry toilets) as part of the pilot project that belongs to this UBSUP project that is aiming to reach 800,000 people in low-income urban settlements with sanitation in the next few years (by 2016). 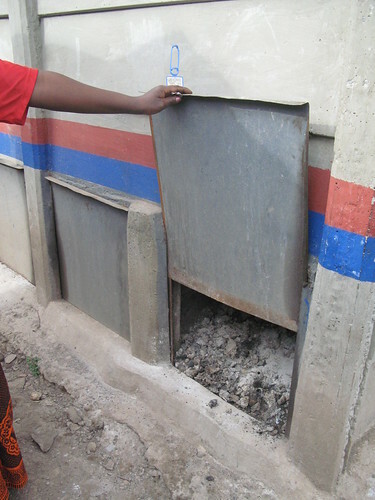 This has the result that elderly people, people with disabilities and children (who cannot reach the lock very well), have problems using this toilet and might prefer to use the old, unhygienic pit latrines (which usually still exist in parallel on the same plot). The difficulty here is to balance cost with comfort. 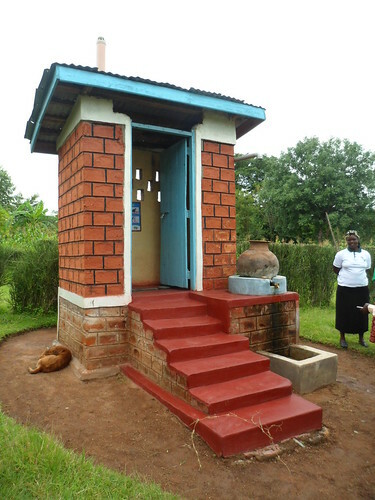 The toilets as they are now cost about EUR 400 (which seems quite expensive to me compared to designs elsewhere, but the construction cost in East Africa are pretty high compare to Asia if one can generalise like this?). If the stairs were made less steep and perhaps with concrete steps, the costs would further. These photos are from a field trip on 18 Oct. 2013 by Elisabeth von Muench which was led by Doreen Mbalo (GIZ Kenya). We went to a low-income area called Bulbul about 30 minutes drive away from CBD, direction south west. We saw 3 UDDTs at 3 different plots. Each UDDT is meant to be used by up to 10 people. If a plot has more than 10 people, then they get a second UDDT. The UDDTs were built in around February 2013, so they were 8 months old when we visited them. These toilets were fully subsidised because they were part of the pilot but when the UDDTs are rolled out, then they will be only partially subsidised. They cost around 400 Eur per UDDT. The material is magnesium oxide boards (for the UDDT at the first plot) and prefabricated concrete panels (at the second and third plot). For all the UDDTs, urine is simply infiltrated and not used. The faeces vaults have not yet filled up, so they have not yet been emptied. At the second plot, they had recently switched from the first faeces vault to the second vault. There are so far 17 pilot UDDTs in low-income areas but the aim is to scale this up next year as part of a project called UBSUP which is funded by the Bill & Melinda Gates Foundation. Faeces will be treated at centralised treatment facilities which will be about 4-10 km distance from the UDDTs. Different treatment technologies will be tested but the main one is biogas sanitation (and also drying? Composting currently not planned?). These treatment facilities are currently in planning (first step is to acquire the land). Urine is not collected but infiltrated because it was deemed too expensive - for now - to establish a urine collection system. And the tenants generally do not grow any crops on the plots, which are too small for that. I will leave you with this description of my field trip and put in a separate post some more points for discussion. Last Edit: 01 Nov 2013 11:34 by muench. What is the ultimate cost of the UDDT that you are aiming for, once this is rolled out at the large scale? 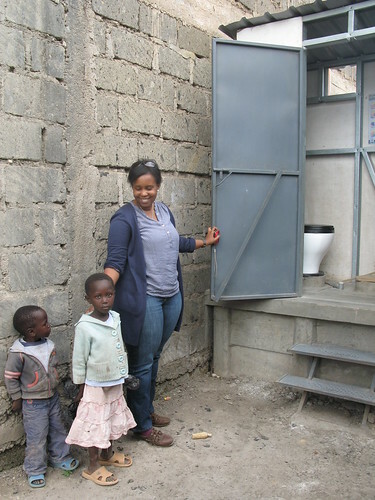 What is affordable for the Kenyan tax-payers in the longer term, given that these toilets will need to be subsidised (which is normal for any sanitation system, also for centralised systems!) and given that one should not rely on external donor funding forever (be it BMGF, GIZ, KfW, others...). This means that 170 USD would be the subsidy, which means 230 EUR would be left for the plot landlord to pay if the total cost of the toilet is 400 EUR. Plus how much in terms collection cost for the faeces? OK, this probably won't amount to very much, as the volumes are dried faeces are relatively low in the scheme of things, the transport distance won't be far and the treatment process should be quite simple (and then? Reuse or burial?). (2) Why should water utilities engage in on site sanitation development in urban and rural areas? Under the new dispensation of the CoK 2010 and the devolution of water and sanitation services, sanitation provision is the mandate of utilities. WASREB is to introduce a sanitation levy once the new draft bill is enacted by parliament in 2013. What do others think of this approach? Do you think it will work? Has it worked elsewhere? Overall, I find the UBSUP project very fascinating because of the high ambition (800,000 people to be reached by 2016! ), and I will follow it with interest over the coming years. I hope we will hear about updates regularly here on the forum. I wish the team good luck and lots of success with it. Last Edit: 01 Nov 2013 11:50 by muench. Getting the final affordable cost of UDDT under UBSUP has been a tough job.Getting low cost materials in Kenya is a problem. The government increased the Value Addded Tax on energy this year from 12-16% making most manufactures to increase the price of goods. 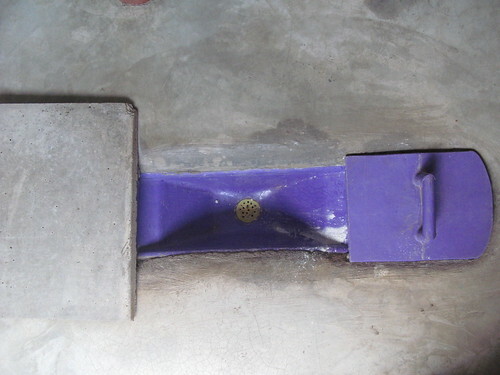 This has also resulted in increased cost of building materials.However, despite all these challenges our ultimate cost for UDDT in urban areas is set between 300-400 euro (designs with different building materials for the households to choose from).The ability to construct such UDDT vary from households to households in low income urban areas. Majority can afford a UDDT costing about 350 euro without subsidy. The reason why we have alot of poor sanitation in low income urban areas is not inability to afford improved sanitation but inadequate enforcement of Public Health Act and National Hygiene and Sanitation Policy by the Ministry of Health (Public Health Department). This is one issue which UBSUP has picked up with the County Governments and Public health officials.It affects sanitation services and sludge management (sludge from septic tanks and pit latrines).We want to apply appropriate and affordable technology which solves the issue of sludge management. The big issue is not affordability but appropriate onsite sanitation systems which can be up-scaled in the whole country to improve access and coverage to sanitation (meeting also the Human rights) and get towards meeting the MDG objectives. 2. The Government enacted a new constituition in 2010 in which water and sanitation is a human right, which is to be provided by County Governments (devolved system) through their agents (water service providers/water utilities). 3. The water service providers/water utilities therefore takes the role as a mandate but will get financial and legal support(National Policy, Water Act, etc) from the National and County governments. 4. The regulation of onsite sanitation services is being worked out by the national regulator and the lincense for Water service Providers will include mandatory provision of onsite sanitation services. Incentives like onsite sanitation levy are also being worked on. The next major step is to enact the Water Policy and Bill 2013 (expected in early 2014) to give the legal framework for giving this mandate to the water utilities. UBSUP through water Service Trust Fund has developed a national concept for up-scaling onsite sanitation at household level with water utilities. This is being piloted currently with three water utilities. If it succeeds, it will be rolled out nationally in 2014. The project seems to be a really a very interesting project with lots of potential for up scaling. Thank you! WSTF, together with GIZ and KfW are very optimistic that we shall be able to achieve our objectives especially since it is the water utilities that will be the driving force of UBSUP. One of the major achievements of the water sector reforms is that there is already a growing involvement of water sector institutions in sanitation and the rights to sanitation has been accepted in Kenya since 2007. In addition, formalization of services has gained increased attention and poverty orientation is much stronger than before. We shall keep you all informed as we progress and always look forward to your inputs, suggestions, critic and feedback. I just wanted to give you an update on the current activities of the UBSUP programme in Kenya. A reminder: UBSUP stands for Up-scaling basic sanitation for the urban poor. 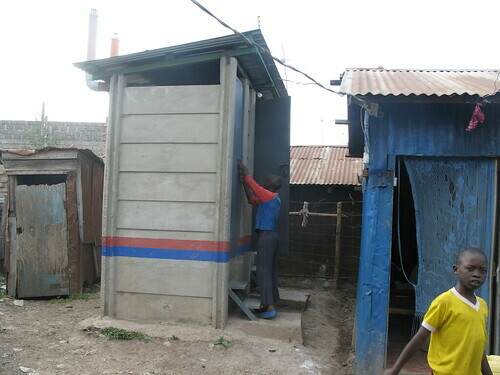 The UBSUP programme has developed, tested and piloted a concept for scaling up improved household/plot-level sanitation in low income urban areas of Kenya. The programme covers the full sanitation value chain and is embedded in the Water Services Trust Fund (WSTF). Financing is done through WSTF which is the pro-poor basket fund of the water sector and is implemented by regulated water service providers (water utilities). The programme is supported by the German Development Cooperation and the Bill and Melinda Gates Foundation (BMGF). GIZ provides technical support through the Water Sector Reform Programme while KfW offers financial assistance. UBSUP has now successfully completed the concept development phase, the testing phase and the pilot phase. 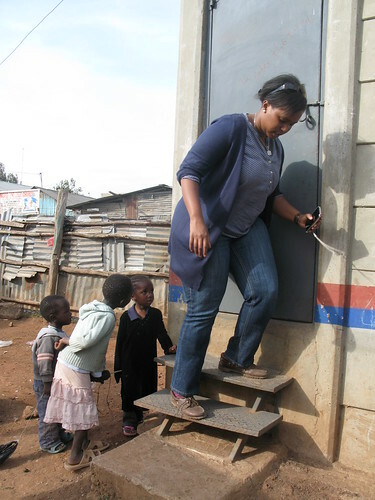 We have constructed over 2000 toilets in 3 towns called Embu, Oloolaiser and Nakuru. Different sanitation technologies have been adopted by the different clients in the respective low income areas. 3 decentralised treatment facilities are currently under construction within those three towns that will cater for the existing and newly constructed sanitation facilities. The 1st call for proposals to the Water Services Trust Fund was initiated in July/August 2014 and has so far attracted applications from 40 regulated water service providers ( water utilities). Last year (November and December 2014), the UBSUP team carried out field appraisals, visiting the different water service providers that had applied to verify and ensure that the information provided in their application forms met the needs of those living in the respective low income areas within their jurisdiction. 20 water service providers have been selected for award. When awarded, the 20 water service providers will proceed to implement in the first UBSUP call. 10 that performed well will be considered for funding in the second batch of the first UBSUP call. Our current tasks include preparing the water service providers for implementation of the 1st call. 3. Timely payment of subsidies by the water service providers is crucial for demand creation. Last Edit: 28 Jan 2015 11:53 by Doreen. Thanks a lot for this interesting update! 20 water service providers have been selected for award. When awarded, the 20 water service providers will proceed to implement in the first UBSUP call. What exactly would they implement? Would all 20 water service providers implement the same technology and systems? How much money would each be awarded? Do you have particular mechanisms in place to avoid corruption disturbing your process? 3 decentralised treatment facilities are currently under construction within those three towns that will cater for the existing and newly constructed sanitation facilities. Which technology or technologies did you select to treat the faecal matter (it is the dried faeces from the UDDTs that will be treated here, right? Or also conventional faecal sludge?). Do you hae any photos from the construction process that you could share? Perhaps you could add your example into that thread and explain to us how this has been possible in the Kenyan context? Last Edit: 03 Feb 2015 08:58 by muench.